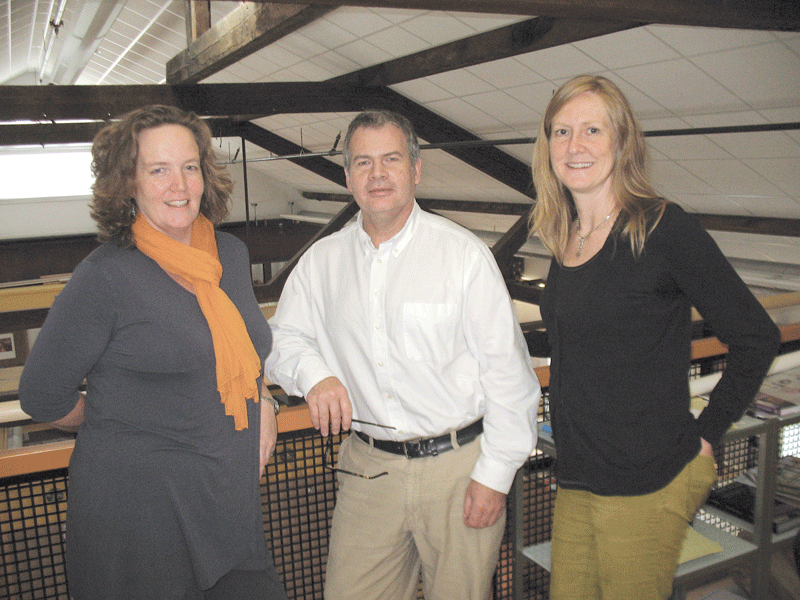 From left, Aelan Tierney, Charles Roberts, and Ann Wills Marshall have all worked on LEED projects at Kuhn Riddle Architects. New England Environmental (NEE) is an Amherst-based consulting firm that specializes in environmental assessment, restoration, and management. Oh, and setting a good example. “We saw that project as sort of a laboratory for the kind of work they do, almost an exhibit of sorts,” said Ann Wills Marshall, an architect with Kuhn Riddle Architects in Amherst, which designed NEE’s new headquarters in Amherst with the sort of ‘green’ features that fit the company’s mission. “They can take clients through and show them what a bioswale is, and a rain garden that uses all native plants and doesn’t require irrigation. It has a tremendous amount of green space,” Marshall noted. The development will earn Platinum certification — the toughest-to-attain rating — from LEED, or Leadership in Energy and Environmental Design, a program developed in 1994 by the U.S. Green Building Council (USGBC) to encourage environmentally friendly and energy-efficient design, construction, and operation of buildings. 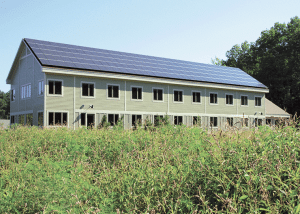 And New England Environmental, which uses both geothermal heat and photovoltaic solar panels for energy, is only one of Kuhn Riddle’s recent LEED projects. Others include the George N. Parks Minuteman Marching Band Building, a 15,000-square-foot facility at UMass; the Ken Burns Wing of the Jerome Liebling Center for Film, Photography, and Video, a 6,700-square-foot addition to the facility at Hampshire College; and the Northeast Veteran Training and Rehabilitation Center in Gardner — which, like NEE, boasts both geothermal and photovoltaic energy. In fact, LEED has become a major buzzword in the architecture and construction world; the state has mandated eco-friendly design on many projects, while individual cities and towns are increasingly seeking out the long-term benefits of energy-efficient, environmentally non-invasive design as well. Those ‘points’ are awarded according to a development’s adherence to five key areas: sustainable site development, water savings, energy efficiency, materials selection, and indoor environmental quality. Sustainable site development includes the reuse of existing buildings, when possible, and preservation of the surrounding environment. Water conservation may include the recycling of gray (previously used) water or the installation of catchments for rainwater. Energy efficiency can be increased by orienting buildings to take advantage of seasonal changes in the sun’s position and by the use of alternative energy sources, such as solar, wind, geothermal, biomass, or water. Meanwhile, developers are encouraged to use as much recycled or renewable materials as possible, or those that require the least energy to manufacture, are locally sourced, or are in themselves recyclable. Finally, indoor environmental quality emphasizes how the building user feels in a space and involves ventilation, temperature control, and the use of nontoxic materials. New England Environmental incorporated both geothermal and photovoltaic energy on its LEED Platinum project. 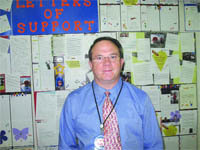 However, they should not get in the way of basic aesthetic appeal, said Aelan Tierney, an associate with Kuhn Riddle. Other architects are saying the same. Among them is Jim Hanifan, a principal with Caolo & Bienek in Chicopee, which recently completed the new UMass police station, the first LEED-certified building on the Amherst campus, but very likely not the last. That project earned Gold status, just under platinum in the USGBC’s rating system, which is based on the points assigned for green compliance. Further down are Silver and simply ‘certified.’ The police station features a geothermal heating and cooling system drawing heat and cold from the earth. Another of the firm’s jobs, the new Easthampton High School set to open in 2013, has earned certification from Massachusetts CHPS (Collaborative for High Performance Schools), a LEED-like green-building program for the Commonwealth. Among the considerations are bigger windows to maximize daylight, a photovoltaic array being installed on the roof to harvest solar power, and LED lighting. “It’s similar to LEED in its requirements,” he said of the CHPS designation. The Liebling Center project at Hampshire College is a good example of a broad mix of LEED points, Roberts said, from the use of native plants to cutting-edge air-quality-monitoring systems, to white, reflective surfaces to keep the building cool. It also gained points for its location along a bus route and the installation of bike racks and showers, all of which encourage earth-friendly commuting. 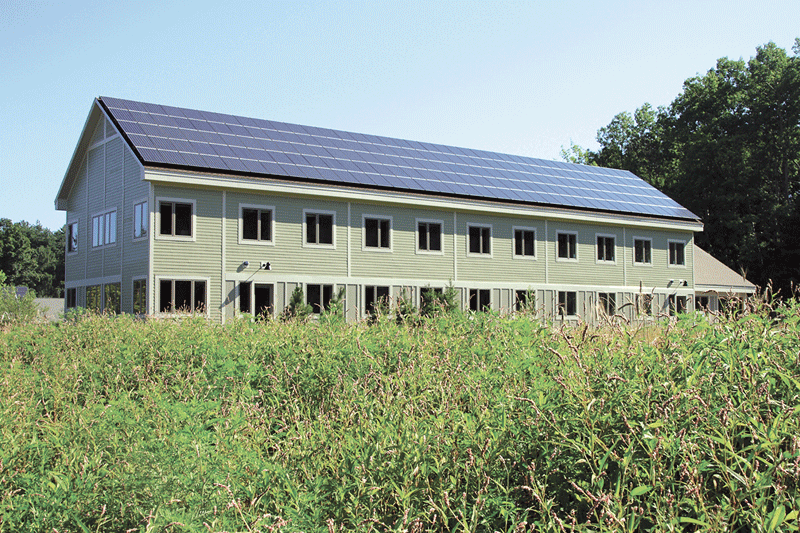 Hampshire College has been pursuing eco-friendly development for some time, and other area schools have done the same. 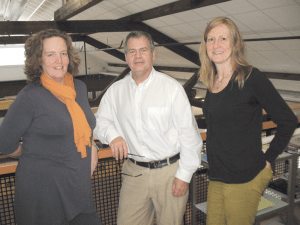 In fact, the U.S. Green Building Council recently opened a local branch on the UMass campus. “The university has been working to expand its green-building commitment for more than a decade now,” said Ludmila Pavlova, a senior planner at the UMass Campus Planning Physical Plant, who started the branch. “Here, we can provide education, outreach, and information to the general public about the LEED rating system and green building. UMass recently made a commitment to build all new structures to a minimum of LEED Silver, and the state already requires all publicly funded buildings of at least 20,000 square feet to be 20% over baseline in terms of energy efficiency. All of which makes plenty of sense to Pavlova. “People live in buildings and spend most of their time in buildings,” she told BusinessWest. “Forty percent of our energy is embodied in buildings. If we want to improve the environment, one of the first basic places to improve it is in the places where you work and live. That’s just one more reason businesses and communities are increasingly choosing to build green — and often taking the LEED while they’re at it.